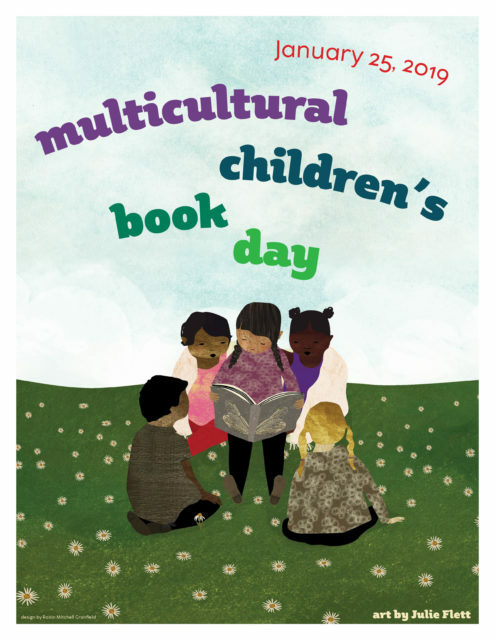 It’s Time to Celebrate Multicultural Children’s Book Day! I am excited to once again be a part of a fun-filled event where diverse books for children are shared and celebrated. I was thrilled to receive a book from Language Lizard. 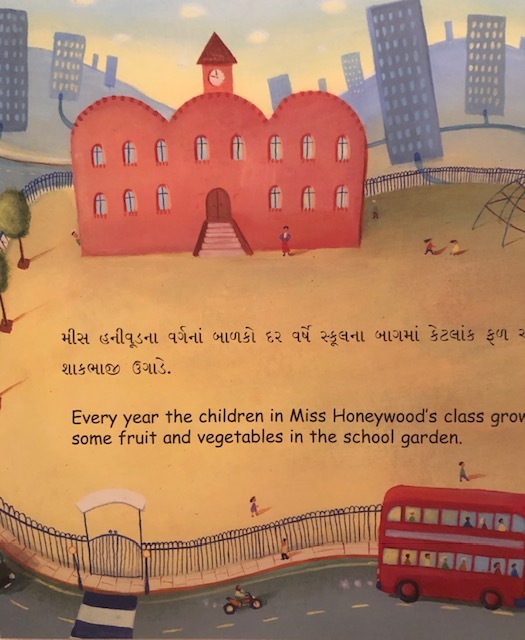 Instead of taking place in the Russian countryside, this version is set at an urban school where Miss Honeywood’s class plants a garden each year. The children prepare the soil, plant the seeds, water, and weed. When the children return from vacation, they are happy to see the fruit and vegetables in the garden. 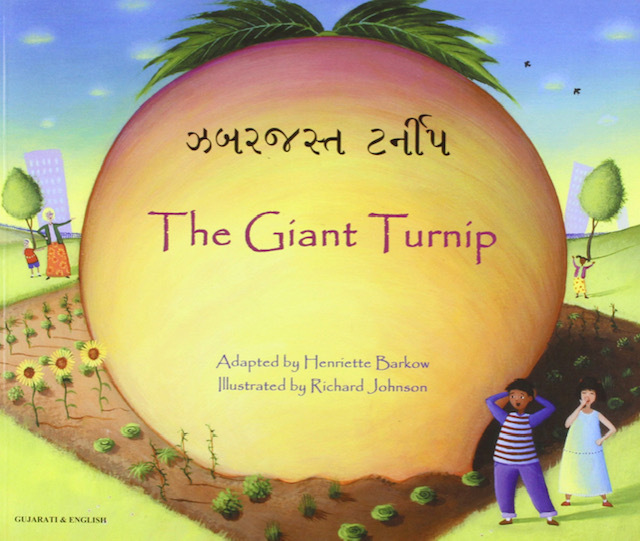 But the turnip now was taller than a giraffe and wider than an elephant! How were they going to get it out? The students come up with inventive ways to harvest the massive turnip but finally decide to tie a rope around it and pull it out together. Of course, after a number of unsuccessful attempts, they finally get the turnip out of the ground and enjoy a feast. 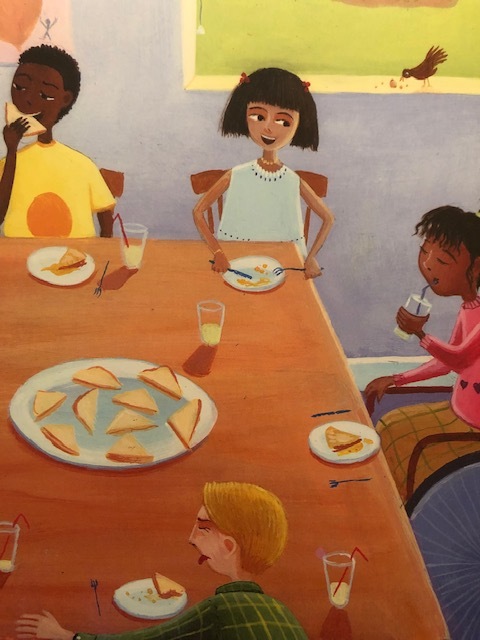 The illustrations show children of all races and include a girl in a wheelchair working alongside her classmates. The colors are rich and seem to glow on the page. Readers will have fun looking at the expressions on the faces of the characters. Check out the boy at the bottom of the illustrations – that’s what I’d be doing since I’m not a fan of turnips. I love the school garden setting, the creative processes the children use to harvest the turnip, and the diverse characters. In addition, the book is written in Gujarati which is a language that I was not familiar with. I may not know how to read Gujarati but I think it is beautiful to look at. 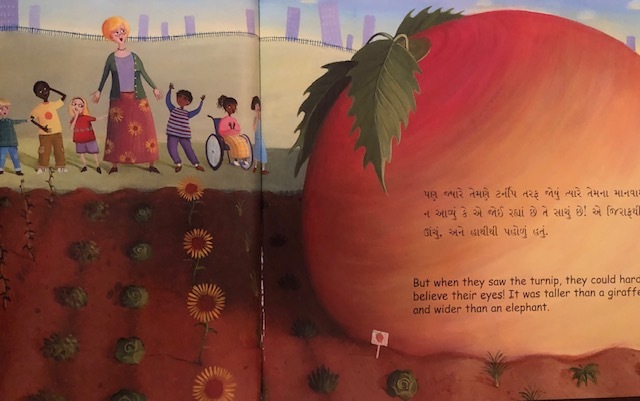 This book is a perfect way to introduce children to the 45.7 million people who speak it in India, primarily in the state of Gujarat. I am very excited to learn about Language Lizard which publishes bilingual books in over 50 languages. There are many books in Spanish that I want to add to the library collection I am building in Nicaragua as well as books that I want to share with Spanish speaking children that I work with as a member of REFORMA. Thanks for the interesting reminder of this great day to celebrate! Thanks so much for adding your great review to our Multicultural Children’s Book Day Giant Linky and for your support of our holiday! I’m so glad you enjoyed The Giant Turnip! Thanks so much for hosting this wonderful event!